How do you fit a three-story house into thirteen feet of space? 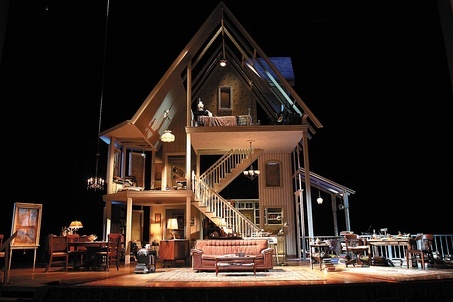 That’s the task designer Brian Perchaluk faced when director Ann Hodges approached him one opening night last year, asking him to design the set (and costumes) for August: Osage County. The original 2007 production featured an onstage, multi-story house that proved so iconic, subsequent Broadway, touring and international productions have nearly always resurrected it. But the Tom Hendry Stage at the Warehouse – the venue chosen for August: Osage County – only has 12 feet 5 inches between floor and I-beam. The solution: a more abstract, poetic concept. Perchaluk kept coming back to the windows. Shuttered in the first two acts, the house’s windows are barriers that keep outsiders from peering in – and the Weston family from looking out. If windows are the eyes of a house, these eyes are tightly shut, like the absent eyes in T.S. Eliot’s poem The Hollow Men. Other poetic sources, referenced by the script, also emerged to help guide Perchaluk’s design, such as John Berryman’s The Curse. Perchaluk has tried to weave these colours into his minimalistic set. The windows hang in dark voids. Rooms appear to be near each other, but have a distinct disconnect – a quality Perchaluk lifted from the central family. Tufts of dead, dry grass suggest a desolate, Oklahoma plains beyond the walls. The goal is to suggest a house formerly of substance, diminished by abandonment and neglect. While layering in these stylistic elements, Perchaluk is blunt about his main goal as designer for August: Osage County – functionality. After all, a play with 13 actors onstage using five main acting areas (often simultaneously) requires a very particular arrangement to make logical sense to an audience. And prevent bodies from bouncing off each other. Perchaluk’s attitude is backed up by a long resume of experience; this is his 50-ish design for RMTC (he says 50-ish after losing count over the years). The Roblin, Manitoba native actually credits RMTC with sparking his interest in theatre. As a child, he was deeply impressed by the touring productions the theatre sent to his school, eventually heading to University of Winnipeg and National Theatre School to launch his career in theatre design. He’s pleased for chances to give back to RMTC, particularly on a play as provocative and well-crafted as August: Osage County. Even with a tight playing space, that doesn’t seem likely. Director Ann Hodges sums up the advantages of Perchaluk’s design.